1. Cut one large and one small circle from Cover Paper and glue together. 2. Make a cut to the centre of the circle. Pull together and overlap to create a cone. Staple. 3. 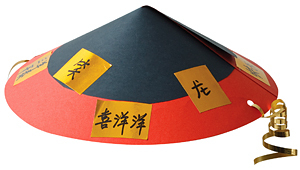 Cut small squares from the Adhesive Squares and write Chinese symbols onto each square. 4. 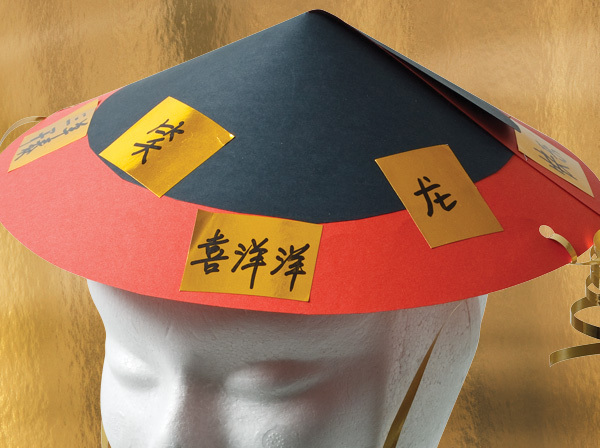 Use a hole punch to create a hole on each side of the hat. 5. Thread Curling Ribbon through the holes and secure for the ties.